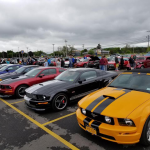 So far, the Spring and Summertime weather has truly benefited the classic car scene just a bit, and with each moment the sun does shine… somebody in Central New York takes a car for a run and creates new memories for those watching…and for those riding! Have you been to a car show? Have you seen the beautiful rides? Ford Mustang, Chevrolet Camaro and Dodge Challenger… pony cars are truly the basis of what most people think about for “Muscle cars today. 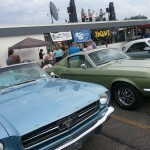 The classic car show and cruise in events (just like the “Rooftop Concert” at the Cort Lanes Bowling Center on Tompkins Street near 281 we had on Tuesday the 31st at 5pm) feature so much more than just those 3 Muscle Cars. Do you remember the Gremlin, the Pacer or Matador? What about the AMX REBEL? Did you know that the inline 6 cylinder engine could have more power than a V8…with a little “bolt on” help? Take the time to go to your local car show and see what you remember….or better yet, take a kid or two to the show! S.E.M.A. (specialty vehicle marketing association) has this to say about just that! “Life is full of choices for kids. You can help them make the right ones by sharing your appreciation for cool old cars. There have been countless studies done to prove it, but virtually everyone knows that spending quality time with a kid is the greatest gift you can give them. And sharing your appreciation for collector cars is a great way to nurture their interest in a hobby that you can enjoy together for many years to come. Take a Kid to a Car Show is an awareness program started by the Automotive Restoration Market Organization (ARMO), a council of SEMA. The program delivers a simple yet effective message to parents and car show organizers about getting youth involved in the collector car hobby; Take a Kid to a Car Show. Whether you produce a high profile extravaganza, a weekly cruise at the local shopping center or an annual charity show ‘n shine, one thing is common; you have a passion for preserving and experiencing our automotive heritage. If we want to ensure that our passion is carried on to future generations we must involve our youth.” Whether you produce a high profile extravaganza, a weekly cruise at the local shopping center or an annual charity show ‘n shine, one thing is common; you have a passion for preserving and experiencing our automotive heritage. If we want to ensure that our passion is carried on to future generations we must involve our youth. As you visit and walk through the past of our automotive history, remember to ensure the future; Take a Kid to a Car Show near you. Teach them about who we were and show them how things have changed over time. Regardless of what the future may hold for these veterans of the street and strip… we already know the past, and we embrace it. We are Americans… and we have “been there, and done that.” Hopefully, this is a legacy and value that we will pass that passion on to our children. Perhaps giving a niece or nephew a “wild” ride that will inspire them to not only remember that ‘crazy” uncle years from now but will serve to spark an interest in our car shows, restorations and desire to go cruising on the way to get ice cream. Take your “time machine” old or new out to the Cort-lanes Bowling Center on Tompkins Street for the Tuesday Nite Cruise-Ins. That’s all for now… see you soon at a car show, I’m “Uncle” Bill OGorman…on temporary assignment!